Michael Miller, the right man at the right time, when the West Coast Hip Hop movement was at its roots. His book titled ‘West Coast Hip Hop: A History In Pictures’, contains original photos and stories of Cypress Hill, NWA, Tupac, Ice Cube, Snoop and House Of Pain to name a few. Mike Millers’ stories are riveting, and yet no matter how mind blowing they may be, all are true stories about the shoots! Mike Miller, the right man at the right time, when the West Coast Hip Hop movement was at its roots. 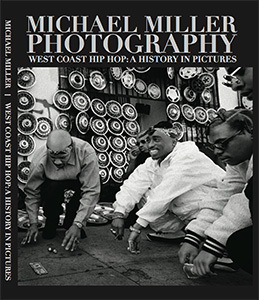 His book titled ‘West Coast Hip Hop: A History In Pictures’, contains original photos and stories of Cypress Hill, NWA, Tupac, Ice Cube, Snoop and House Of Pain to name a few. Mike Millers’ stories are riveting, and yet no matter how mind blowing they may be, all are true stories about the shoots!